27 1/4" wide x 15" deep x 63" high. 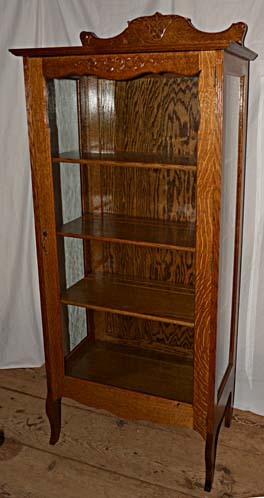 Here is a simple Square Oak Glass Cabinet with four shelves. Each shelf has a double plate groove for display, and there are multiple settings for these shelves. 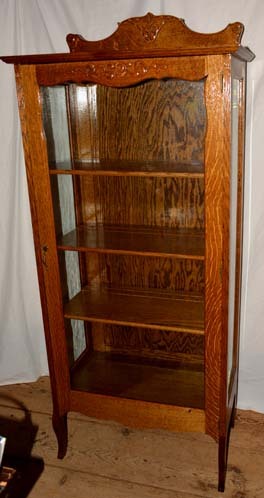 This cabinet has great visibility with a glass door and glass on the sides. The carving on the back splash and on the door is subtle and well-done. The cabinet has the original lock and two keys for the glass door. The cabinet has been meticulously restored just as it was in the 1800s by our team of professionals. Contact BARN ON 26 ANTIQUES for further details.